Max von Laue was born in Koblenz, Germany, in 1879. He studied at Gottingen and Berlin before joining P at the Institute of Theoretical Physics in Berlin. Laue was a pioneer in measuring the wavelength of X-rays by their diffraction through the closely spaced atoms in a crystal. This work led to the techniques of X-ray spectroscopy, used in nuclear physics. In 1909 Laue moved to the Institute of Theoretical Physics in Munich and in 1914 won the Nobel Prize. After the First World War he became director of the Institute of Theoretical Physics in Berlin. In 1940 Laue refused to join the German atomic bomb research team led by Werner Heisenberg and in 1943 resigned from the institute in protest against the policies of Adolf Hitler. In April, 1945, Allied forces arrested German scientists such as Laue, Otto Hahn, Carl von Weizsacker, Werner Heisenberg, Karl Wirtz, and Walter Gerlach. These men were now taken to England where they were questioned to see if they had discovered how to make atomic weapons. 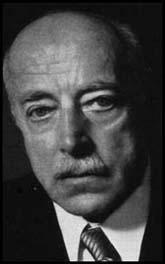 After the war Laue returned to Germany and in 1951 became director of the Max Planck Institute for Research in Physical Chemistry. Max von Laue died in 1960.